a bitor b performs a bitwise OR between a and b. Both a and b are treated as 32-bit (4-byte) integer values, so an eventual fraction will be ignored. In 20-sim, all bitwise function arguments are treated as 32-bit integers. Thus the binary representation of 30 (ignoring leading zeroes) is equal to 11110 as shown in the figure below. Similarly, the binary representation of 9 is 1001. 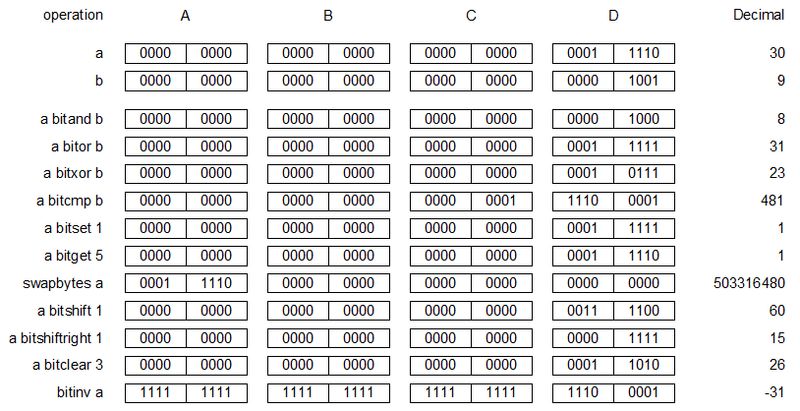 The binary value of 30 bitor 9 is equal to 11111, which corresponds with a decimal value of 31.